There are many dumb reasons I never told you just how hilarious this adventure was. Snippy knows one. My mom is another – it can get a little vulgar over there. Everyone gets a dirty nickname. * There’s a trail you have to find. There’s beer on trail. There’s beer at the end of the trail. There are silly songs to be sung. That about sums it up I think – it’s a general good time. There’s also a volleyball version of the group that meets up during the week, which MK far prefers over running. He’s super excited this time around to return to that group – our new place is within walking distance of where they play. I’m really looking forward to getting back into beach shape, and using these super duper new and strong ski legs will hopefully make it easy this time around. 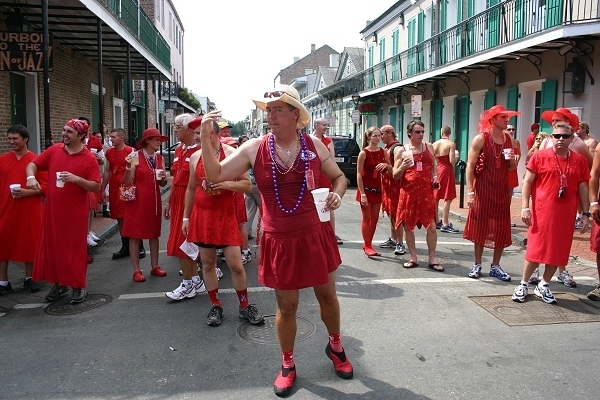 A Red Dress Run. To be safe, no one I know. *I’ll share our names with you here – we were fortunate not to get dirty ones. I was named “Depreciating Asset” in reference to this story here. MK was named “No Beer, I’m Queer”** by the hash (there’s a big voting group ceremony after your 6th run where you get named by the mob). The club drinks beer. MK does not. Pretty funny. **I’m pretty sure that when my Dad was preening me to become the SUPER AWESOMEST WIFE EVER he had no idea I’d end up with a man that hates watching sports and drinking beer. I couldn’t believe it. When I first heard of the concept of marriage – all I looked forward to was the nights at home on the couch with a 6 (12) pack and a delivered pizza, watching the game. Huh. At least I was cool for a little while in college. This entry was posted in Adventures, Hash House Harriers, San Diego, California, Sports. Bookmark the permalink. you should twitter from your next hashing event. or just more in general, since i know your phone is attached to your hand/purse! I’m not witty enough to Twitter more for all 10 people that follow it, maybe someday… I was thinking about how we could integrate Twitter though – for run starts and on-in (where we all end up) – it would be fun!